Summary: Wiring an exterior wall light: Learn how to wire an exterior wall light, prepare a new lighting circuit, fit a boxed light fitting, fit a bracketed light fitting, install an inside switch, and fit an outside switch. This is a non-notifiable project providing the spur is not run from a circuit in a kitchen or special location. 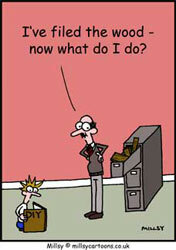 Installation must conform to Electrical Regulations. The safest way to install a wall light is to run a spur from the indoor lighting circuit. It is also possible to run the spur from a socket outlet on the ring-main via an FCU. The switch should be placed on the inside of the wall and you will need weatherproof light fittings designed for mounting on an outdoor wall. 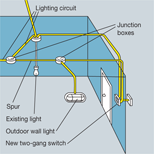 Install a spur and junction box by following one of the methods outlined in Extending Lighting Circuits. To run the spur from a ring-main socket, follow directions for Extending Circuits and Installing Fused Connection Units. Prepare the cable route for the spur cable from the lighting circuit or FCU to the junction box. Prepare the cable route from the junction box to the lighting point. Prepare the cable route from the junction box to the switch. On the inside of the wall, make a mark at about 1.8m (6ft) from floor-level and drill a hole for the cable from the chase through to the outside wall. The lighting circuit for a new exterior wall light. If your wall light consists of a bulb between a base and transparent cover, you can fix it to the wall by the base. Hold the base of the light in position on the outside wall and draw around it, marking the screw holes. Drill and plug the screw holes. Feed the cable through the hole in the wall from inside and thread it through the hole in the light base. Screw the base to the wall. Prepare the cable and cores for connection and sleeve any bare earths in green-and-yellow insulation. Connect the live and neutral cores to separate terminals in the bulb holder and the earth to the earth terminal. If your light is fixed to the wall with a bracket as in many lantern-style fittings, it will already have flex protruding from the bracket. Prepare the supply cable and the flex for connection. Connect the flex tails to the terminals in one half of a connector block. Connect the supply cable cores to the terminals opposite so that lives (brown), neutrals (blue) and earths are opposite each other. Fit a gasket around the base of the bracket to prevent water contact with the conductors. Screw the bracket to the wall and apply silicone sealant around the base to make a watertight seal. Feed the switch cable through the hole in the back of the switch mounting box and screw the mounting box to the wall. To install a flush-mounted mounting box, follow the instructions in the project on installing sockets. Prepare both ends of the switch cable and the cores, insulating bare earths. Place a piece of brown insulation tape around the blue core to label it as live. At a four-terminal junction box connect the live (brown) core from the flex or lighting fixture and the brown-tagged blue core (tagged live) from the switch cable to one terminal; connect all the remaining live (brown/red) cores (from the spur cable and switch cable) to one terminal; the neutral (blue/black) cores (from the spur cable and flex) to another terminal; and the earths to the last spare terminal. If you are installing a new switch for the light fitting, at the switch, connect the cores to the face-plate terminals: live core to the top terminal marked TOP or COMMON, neutral core either of the bottom terminals and earth to the earth terminal in the switch mounting box. If you wish the light fitting to be controlled by an existing switch, replace the existing switch face-plate with a two-gang switch. Connect the cores in the new switch cable to the first gang terminals and the original switch cable to the second gang in the same way as for a new switch. To fit an additional switch outside, make the inside switch a two-way switch and place a one-way weatherproof switch on the outside wall. It should be positioned back to back with the inside switch. Drill a hole to pass the cable between the switches. Thread a short length of three core and earth cable through it. Follow instructions for installing two-way switches.